More Range - Better Accuracy! Introducing the new and improved Fowler/Trimos V+ Series height gages. The V+ Series offers the same great features of the V-Series height gages with and extended range of up to 9 inches with the addition of a second probe holder. Utilizing the latest in Sylvac electronics, the V+ Series height gages allow for measuring of heights, surfaces, inside & outside diameters, slots and centerline locations all without changing probes. The gage is perfect for both the lab and shop environments. A new electronic display complements the V+ Series height gages and adds many features not normally found in gages of this type, such as the ability to automatically calculate both internal/external diameters and centerlines, offsets, slot widths and grooves. 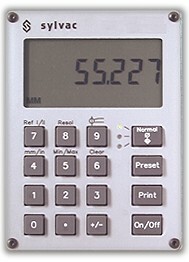 Min and Max functions are also included. The large LCD is simple to read and understand with icons and visual cues relating to the various measuring applications. Advanced electronics for simplicity and extreme ease of use. 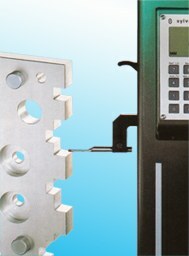 Best accuracy of any gage in its range and price class. Constant measuring force improves operator repeatability.